TODAY’S GAME: Today the Generals continue their 9-game homestand, with game 2 of the 5-game set with the Montgomery Biscuits (TB). The Generals look to snap a 3-game losing skid. The Generals are 6-6 against Montgomery this season, 2-2 at Pringles Park. Jackson leads the overall series with Montgomery, 68-65. The two teams meet 11 times during the month of July. GENERALS RECAP: The Generals dropped their 3rd straight Tuesday in the opener against Montgomery at Pringles Park, 2-0. Jackson was shutout for just the 6th time this season. The Generals now trail the Chattanooga Lookouts by 1 ½ games in the North Division 2nd half standings. The game was a pitcher’s duel and scoreless through the first 7 innings. Generals’ starter Brandon Maurer (pictured right, Donna Manns) struck out a season-high 8 batters, tossing 7.0 scoreless innings, allowing just 4 hits. Montgomery starter Alex Colome (7-3) also tossed 7.0 shutout innings and picked up the win. In the 8th, Jackson reliever Jonathan Arias (1-3) walked the bases loaded with two outs and balked in the first run of the game. Shawn O’Malley crossed the plate and the Biscuits led 1-0. Arias suffered the loss. 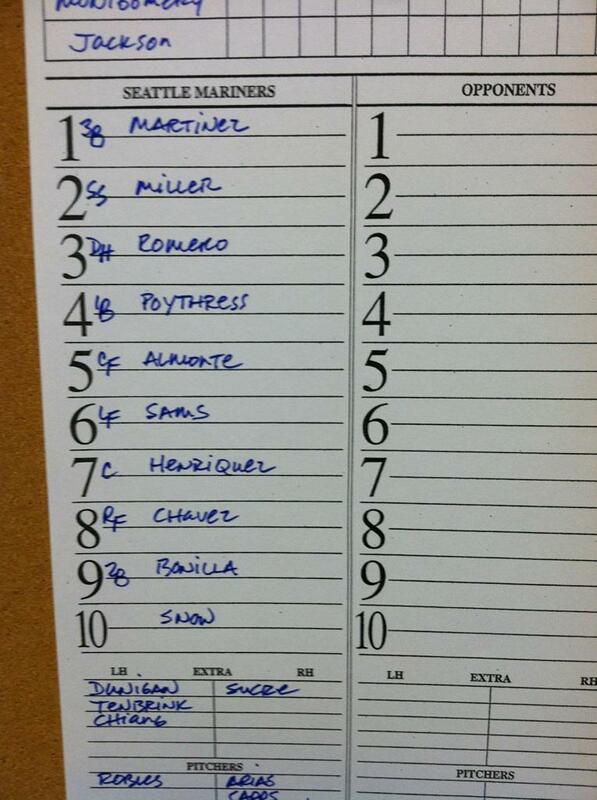 Montgomery made it 2-0 in the top of the 9th with a solo homer by Greg Sexton against reliever Mauricio Robles. Offensively the Generals were 1-for-9 with runners in scoring position and only one General collected a multi-hit game. Johermyn Chavez was 2-for-2, with a walk. MAURER POWER: Generals’ starter Brandon Maurer now ranks 6th in the Southern League with a 3.51 ERA after posting his 11th quality start Tuesday night. 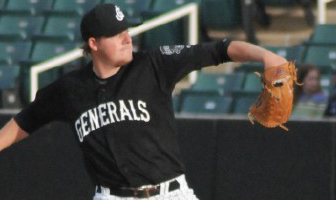 Maurer leads the Generals in wins (7), strikeouts (96) and innings pitched (115.1). In 4 starts in July, Maurer is 2-0, with a 2.45 ERA in 25.2 IP and 28 strikeouts. Maurer’s ERA was 4.62 in May, 3.05 in June and 2.45 in July. NEW ERA IN SEATTLE: The Seattle Mariners announced Monday they had acquired right-handed pitchers D.J. Mitchell and Danny Farquhar from the Yankees in exchange for right fielder Ichiro Suzuki. Cash considerations are also included in this trade. “KISS IT GOODBYE”: Over the course of the last 9 games, the Generals have hit 9 home runs, including 3 multi-homer games. The Generals lead the league with 77 homers this season.. FEELS GOOD AT THE TOP: The Generals 59 wins are the most in the Southern League. Jackson ranks 1st in pitching, with a 3.18 ERA and T-2nd in team batting average at .262. The Generals lead the league in total bases, slugging percentage and home runs with 77. WHO’S HOT? : INF Rich Poythress has hit safely in 17 of his last 18 games, reaching base in all 18, batting .419 (26×62) with 7 runs scored, 6 doubles and 7 RBI. VIVA LA ROMERO: INF Stefen Romero has hit safely 21 of 26 games with 13 multi-hit games with Jackson since his promotion, batting .347 (35×101) with 18 runs scored, 10 doubles, 2 triple, 4 home runs and 27 RBI. MARINERS FUTURE IN JACKSON: The Generals roster currently contains 11 of the top 30 prospects in the Seattle Mariners organization, including three of the top six.